Received the first John Chambers Award of the Central States VHF Society at the Conference in Sioux Falls, South Dakota in August of 1971. In 1982 the Central States VHF Society created the Wilson Award in his honor. The world above 50 MHz lost one of its truly great inhabitants with the passing, on February 3, of Mel Wilson, W2BOC. For over 40 years, Mel devoted a substantial portion of his time to the study of sporadic E and auroral propagation, and significantly added to mankind's knowledge of these two modes so important to our exploitation of the vhf bands. In quest of proof of his belief that some types of sporadic E are triggered by violent atmospheric storm systems, he systematically pored over stacks of weather maps, correlating their information with mountains of reports submitted by hundreds of amateurs. From this mass of data, Mel was able to trace the "birthplaces" and subsequent migration of literally thousands of sporadic E clouds responsible for hundreds of openings occurring over several decades. His findings were documented in a number of articles, including a major two-part work that appeared in QST for December 1970 and March 1971. A particularly outstanding example of his painstaking use of amateur-supplied data was presented in conjunction with a talk he gave at the 1973 Central States VHF Conference. It consisted of a film produced with WA5HNK. To create the film, they pieced together hundreds of still photos of maps, each showing plots of Es paths existing at a specific time. The result graphically displayed the life history of a typical opening. This was only one of many talks W2BOC presented at Central States Conferences. 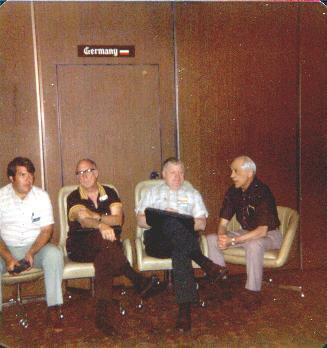 He was a regular attendee of these annual meetings of vhf-minded hams since they began in 1967. 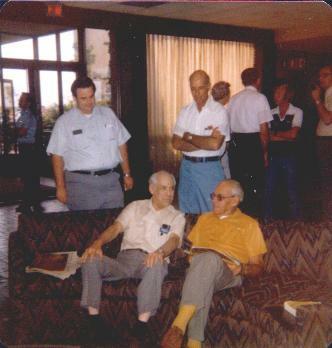 In addition to formal talks given at these and other amateur gatherings, he spent many hours in individual discussions with fellow hams sharing his interest in sporadic E and related subjects. As well as being very patient in explaining the intricacies of the subject, he was always eager to hear the observations, thoughts and ideas of others. Mel Wilson was one of those for whom it can truly be said that the world is better informed because of his diligent pursuit of a keenly held interest and the insight that he brought to bear in unraveling some of its mysteries. Of course, this is especially so for our particular niche in the hobby of Amateur Radio. But that's only part of the work of this man. In addition to his outstanding contribution to the physical science of radio propagation in connection with his hobby of Amateur Radio, he was, in his professional career, a noted expert on the subject of underwater sound propagation. As such, he materially aided the defense of his country during the Second World War and for years thereafter in the vital field of sonar. As with all of his friends, I will miss Mel's absence from Central States Conferences and other amateur meetings but I, for one, will be content in the in the knowledge that his contributions will serve as a foundation and guide for others also gifted with his brand of curiosity, insight and determination to learn how our signals get from one place to another. Their own accomplishments and discoveries will be the best monument to him and his work that I can imagine. I am certain that Mel would echo this feeling.